Great Bear is involved in many different and on-going projects, some which are Polar Bears, Arctic Ecosystems and Global Climate Change, mitigating human-related food sources for bears in the Missoula and neighboring valleys with the Bears and Apples Project, the Illegal Trade of Bear Parts, Ethics and Accuracy in Wildlife Media, a documentary film on Charles Jonkel and the Chilkoot River Monitoring Project. GBF continues to be actively involved in grizzly bear recovery efforts throughout the lower 48 states in order to secure a stable plan that is based on solid science and applied management. The foundation has also worked with the Yellowstone to Yukon (Y2Y) Conservation Initiative which aims to protect grizzly bear linkage zones and habitat in Canada and the United States. GBF supports ethical hunting, but is against baiting and considers the use of dogs – as well as spring and den hunting – unnecessary, inappropriate, and significantly stressful for bears. The foundation plans to address these issues by working with citizen groups, environmental organizations and agencies to continue education campaigns and also combine efforts and resources with other groups. GBF has also had the opportunity to testify before Congress against the unethical baiting of bears. The international trade of bear parts is increasing at an alarming rate. GBF continues to support efforts to stop the trafficking of bear parts, and the work done by the Convention on the International Trade in Endangered Species (C.I.T.E.S.) so that they can develop more effective education and enforcement programs. Read Bears Suffer and Die as the Parts Trade Continues. The Great Bear Foundation has a long history of promoting ethical, accurate, and sensitive wildlife media, and working to eliminate the inaccurate, sensational portrayal of wildlife and the harmful practices that accompany them. See the Ethics and Accuracy in Wildlife Media tab. 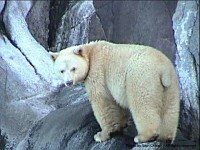 The spirit bear, also know as the Kermode bear, is a rare subspecies of the black bear living on the islands and mainland of B.C.’s mid-coast. This rare subspecies of the American black bear is made up of both black and pure white color phases, with a striking, polar bear-like appearance. Although black bears may be born white on occasion anywhere in their range due to a genetic mutation, as many as one in ten Kermode bears is born white on Gribble Island, and in other parts of the subspecies’ range, the frequency is closer to one in fifty. The rare spirit bear lives only in this remote, wild area of British Columbia. The home of the spirit bear is now threatened by Enbridge Inc.’s proposed Northern Gateway Pipeline and tanker project, that would transport dirty bitumen crude oil from Alberta’s tar sands to a port in Kitimat, B.C., to be shipped out to Asian markets in super-tankers that can hold up to 2 million barrels of oil, through the heart of spirit bear habitat. The habitat is sensitive, and the marine waters are treacherous. An oil spill the scale of the Exxon Valdez spill could cover the coast from Washington State to southern Southeast Alaska. Tar sands bitumen is the heaviest, most viscous from of crude oil, and its nature makes cleaning up a spill nearly impossible even in the best conditions. The remoteness of the wild habitat makes responding difficult, and extreme weather could easily delay spill response by weeks. In addition to the ecological losses that would result from an oil spill, First Nations in coastal B.C. depend on marine resources for their food and livelihood, and the larger Canadian economy relies on the valuable fisheries and other natural resources. A spill could destroy some of the world’s last wild Pacific salmon runs. Learn more about the Enbridge Northern Gateway Pipeline and tanker project and the Gitga’at Nation’s fight to save their home and spirit bear habitat here. Listen to spirit bear guide, Marven Robinson’s eloquent account of how Enbridge threatens his home and community. This short (9 minute) film shows what happened when Enbridge’s pipeline spilled tar sands bitumen into Michigan’s Talmadge Creek and, ultimately, the Kalamazoo River, and what we can expect from Enbridge’s proposed project in B.C. Click here to see “Drums of the Great Bear,” a short (6 minute) film by Damien Gillis showing the Gitga’at, Tsimshian, and other First Nations’ powerful demonstration against the pipeline project in Prince Rupert, B.C. in February. The Great Bear Foundation supported the efforts of the Kitasoo and Heiltsuk Nations and the Valhalla Wilderness Society in B.C. that led to the creation of a Spirit Bear Conservancy in 2006, protecting habitat not only for spirit bears, but also for the myriad species of the rare temperate rainforest ecosystem. Polar bears are under increasing pressure from habitat loss and destruction due to oil and gas development, toxic wastes, unregulated and industrial eco-tourism operations, global warming and seal and fish over-harvesting. The foundation has addressed these issues, conservation strategies and reviewed provincial and federal plans in order to develop new plans to improve polar bear conservation. The Great Bear Foundation works hard to raise awareness of the Arctic and the threats facing the region, its people, and wildlife, by establishing real, concrete connections between the Arctic and the citizens of the world who must be entrusted to look after this rare and precious region and its ecology. Through field courses, public lectures, slide shows, and educational programs for schools and youth groups, we are constantly working to bring the Arctic to the people. By teaching people to talk Arctic, and introducing people to this unique and fascinating region, GBF fosters personal connections that promote better awareness and stewardship of the region, so that we may be conscious of how our daily actions at home affect not only the natural world around us, but also in the far-off circumpolar region that is so vulnerable to air and water pollution, PCB contamination, and, perhaps most devastatingly, global climate change. The ongoing trade in bear parts around the world has been a serious concern to conservationists for more than a decade. Repeatedly, the scenario is the same in parts of North America’s (N.A.) vast wilderness areas: a hiker or conservation officers come across the mutilated corpse of a young black bear – shot, its paws cut off and the gall bladder cut out of its abdomen. Many Asian cultures have for centuries used bears for food and medicine, and the practice continues today. For over 3,000 years many cultures such as the Chinese have used bear parts Traditional Chinese Medicine (TCM). In several countries including China, South Korea, Japan, and Vietnam, bears are caught and killed to supply the medicine and parts trade. TCM is practiced by more than 2 billion people; at least 1 billion of these are Chinese. All eight species of bear around the world have been used to supply the parts. While the blood, bone and paws of bears have been used by consumers, it is the gall bladder that is most sought after and highly prized. The bear’s bile or gall is treasured for its purported medicinal properties, and is used in a variety of ways. The digestive fluid contains UrsoDeoxyCholic Acid, which is believed to cure a variety of ailments and is registered as a medicine in several Asian countries. There are at least 40 different companies that sell some form of bear gall extract in their products. The gall is considered to be an effective treatment for a variety of ailments including heart, lung, liver, blood, spleen, throat and bladder ailments. It is also used to treat cancer, colic, fevers, hemorrhoids, and cirrhosis and is now found in shampoos. The extracted gall is prepared in pills, tinctures, tonics and ointments. TCM shops and pharmacies in Thailand, Taiwan, South Korea, Japan and China supply these various medicines, all purported to contain bear gall. As the wealth of Asian nations increases in the past 20 years so has the consumption of bear gall products. The result has been increased pressure on bear populations both due to overhunting and loss of habitat. In the past 10 years it has lead to increasing concerns about the killing and use of NA bears – particularly black bears to supply the trade. Increasing incidents of bear carcasses stripped of their paws and gall bladders across N.A. has raised concerns among the various government agencies in Canada and the U.S.A., conservations organizations and the wider public. Many have pushed for better legislation, conservation efforts, law enforcement and changes in wildlife protection to help bears. Many groups have likened the threat to the trade in rhino horn and tiger parts in Asian medicine. Rampant poaching over the last 30 years has pushed these charismatic large mammals to the brink of extinction in most of their remaining habitat in Asia and Africa. Many Asian bear populations are now seriously depleted from increasing human pressure due to habitat loss or being killed directly. Gall bladders and paws from Asiatic black bears, brown bears, sun bears and sloth bears are all marketed, but the strongest demand is for Asiatic black bears. While other Asian bear species are killed because of safety concerns or to protect crops, Asiatic black bears are killed primarily for their parts. The bears are either killed directly by commercial bear poachers, by hunters looking for other game such as deer, or by farmers protecting crops or property. In areas where guns are largely prohibited devices such as wire snares, pit traps, or crude home-made bombs (which the unfortunate bear triggers by biting) are used for killing. After the bear has died the parts are cut away and sold to the first of perhaps several buyers in the trafficking pipeline (even though this is officially illegal in most of Asia). In order to reduce the pressure on wild bear populations the Chinese and now the South Korean government have set up ‘Bear farms’. In these facilities more than eight thousand Asiatic bears are kept. The term farm is somewhat misleading, given that most of the bears confined within them are not bred in captivity, but were cubs taken form their dead mothers. In them bears are kept in appalling conditions in very small cages for the express purpose of ‘milking’ the bears gall bladders with surgically implanted tubes. This procedure can often cause painful chronically suppurating wounds in the bears abdomens. At such facilities hundreds of bears are kept in rows of cramped cages only a few feet apart, many can be heard moaning in distress. Despite the availability of this ‘farmed’ gall many purists still believe in using only the gall from wild bears, and will pay significantly more for it. Because of depleted Chinese, Korean and Vietnamese bear populations to feed the trade, the pressure has increased on bears from elsewhere. The gall bladders from sloth bears in India have been traded, even polar bear gall bladders from northern Canada have been used for TCM. Campesinos in Peru have also traded in galls using the organs taken from South America’s only ursid, the endangered spectacled bear. Because it is difficult to assess the number of bears actually being killed and government agencies in N.A. and elsewhere, will not release those records, just how many die to supply the trade is hard to say. However, many wildlife agencies and conservation organizations agree that it is a serious concern regarding the poaching of bears and smuggling of contraband. Furthermore with increasing access into areas that were previously unroaded, more underground connections and higher demand, the pressure for parts on wild bear populations will only increase. While the parts trade itself may not be a significant threat to any one large population of bears, its effect combined with loss of habitat, climate change, and loss of food types may significantly affect a specific bear population to the point of causing irreparable damage. In N.A. and around the world, bears and other wildlife bears are protected under the regulations of the Convention on International Trade in Endangered Species (CITES). CITES helps to regulate and control the import and export of animals and plants between member nations. Member countries of the convention meet biennially to discuss which species do or do not need protection. Most of the worlds bear species are protected either under Appendix 1 or Appendix 2. Those bear species which are deemed to be critically threatened such as the panda and the sun bear are protected under Appendix 1. Over the past 25 years Federal, State, Provincial and Territorial Conservation Officers in N.A., and other law enforcement officials have cracked down on the parts trade. Each agency has been involved in scores of investigations, wildlife sting operations, arrests and trials of both foreign and domestic traffickers in bear parts. Various people have been caught smuggling bear gall bladders in bottles of liquor, boxes of chocolates (with chocolate covered galls) and false bottom luggage. Furthermore, restaurants and other establishments in Chinatowns and Korean districts have been raided and freezers were found to contain bear parts. The paws or gall bladders from scores of both black bears and grizzlies removed from the bodies of both adults and cubs were seized. The paws are used for bear paw soup, which is a highly prized Asian delicacy. One bowl of it may cost the patron one thousand dollars or more. Some connoisseurs believe the flesh of the right paw actually tastes sweeter, since they believe that bears favour using their right forepaw to scoop out honey from the hive with it, and then lick the sweet liquid off the pads. Bears are slow reproducing animals and cannot suffer serious losses to their populations for long. Therefore if conservation efforts to protect them in N.A. and elsewhere are to succeed then improved legislation, public education, law enforcement and prosecution must all support the protection of bear populations and sound conservation measures. While globalization increases and NA, European and Asian trading blocks become more established with huge amounts of capital fuelling various economic interests’ wildlife conservation will likely suffer. As resource consumption is ratcheted up, the protection and conservation of wildlife therefore becomes even more critical in the overall equation. In an effort to address the trade, conservation organizations such as Animals Asia Foundation have placed public service spots on Asian Television. Among those who have appeared are movie star and martial artist Jackie Chan who has spoken out about the cruelty of the bear bile farms and the trade in tiger parts. During the current severe economic downturn in N.A. there are severe/increasing budget cuts to enforcement staff in many government agencies. This understandably will decrease there effectiveness of ongoing efforts to monitor and apprehend those who traffic in bear parts. To protect and conserve NA’s bears the laws ideally should be consistent in Canada, the US and Mexico with international cooperation to monitor those involved in possible bear parts trading. However a patchwork of different laws of various parts of Canada from provinces or elsewhere in the U.S.A. with various states will not provide a cooperative or consistent effort to protect bears. It is vital that officials from different government agencies address the severity of the problem of the parts trade and then put plans in place to curb it. Because of its enormity, vast areas of NA wilderness are not adequately policed and budget cuts to various departments have meant fewer conservation officers. In an effort to address the hodgepodge of U.S. jurisdictions and inconsistent laws regarding bear conservation, H.R.3480: Bear Protection Act of 2009 is currently before the House of Representatives. Bill 3480 is an amended version of a piece of legislation proposed by Kentucky’s Senator Mitch McConnell who raised concerns about the killing of bears for parts, several years ago. Among those who spoke before the House was Dr. Dave Garshelis of the Minnesota Dept. of Natural Resources, and President of the International Association for Bear Research. Dr. Garshelis has studied bear conservation issues for more than 25 years, and his testimony has been critical in getting state and federal representatives to recognize the gravity of the parts trade and better legislation. Hopefully with its eventual passage, the incidents of bear poaching and gall bladders being smuggled and sold to buyers in the U.S. will be significantly reduced. What do apples have to do with bear conservation? An apple a day may keep the doctor away, but certainly not the bears! 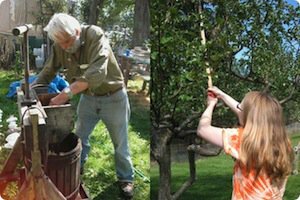 Contact us to help out as a volunteer fruit picker, or if you need help picking your fruit. The Bears and Apples program has been generously funded by Patagonia, Yellowstone to Yukon, and private donations. You can help us prevent conflicts between humans and bears by donating to our program. Public Performance Rights must be purchases for all public screenings. Visit our shop to purchase a one-time license. Dr. Charles Jonkel devoted his life to the study and conservation of wild bears and their habitat. A pioneer of bear biology, Jonkel was one of the first four researchers to study black bears in the field after the invention of the dart gun, and the Canadian government sought him out to lead their groundbreaking research on wild polar bears. Jonkel died April 12, 2016 in Missoula, leaving behind a legacy of bear conservation, habitat protection, generosity and love. In his eight years in the Arctic, Jonkel compiled the first reliable, comprehensive scientific database on wild polar bears. Realizing the cultural importance of the polar bear hunt to Native people and its vital place in their subsistence lifestyle, Jonkel fought for and secured Native hunting rights in Canada. He and others set up the Polar Bear Specialist Group of the International Union for Conservation of Nature (IUCN), creating a framework for cooperation among the five countries with polar bear populations, a model for all IUCN specialist groups. Jonkel co-drafted and was signator of the International Agreement on Polar Bear Conservation (Oslo 1973), which mandated the regulation of sport hunting while protecting indigenous subsistence hunting rights. Dr. Jonkel died in Missoula on April 12, 2016, leaving a legacy of conservation, research, and community. If you would like to make a tax deductible donation to the film project, click “Donate” below and you will be transferred to the film project’s secure page at PayPal. After nearly a decade working on polar bears, Dr. Jonkel returned to Montana where he taught wildlife biology at the University of Montana. His Border Grizzly Project was one of the most comprehensive studies of grizzly bears and their habitat requirements ever conducted. As a result, for the first time ever, policymakers and biologists were forced to examine the cumulative effects of all human activities and all other impacts on wildlife, rather than just the immediate, direct impacts of a specific project. Jonkel went on to direct research on aversive conditioning, testing the effects of potential bear repellents on black and grizzly bears. While Jonkel is considered a father of bear biology, his influence extends far beyond the scientific community. Studying polar bears, he fell in love with the Arctic and became a champion of this little known northern world and the people and wildlife that inhabit it. For decades later, as President and Scientific Advisor of the Great Bear Foundation, Jonkel continued his crusade to teach people about the Arctic, as well as the world’s eight species of bears and the need to preserve their habitat. He has also worked for accuracy and quality in wildlife films and founded the International Wildlife Film Festival (IWFF) in 1978. 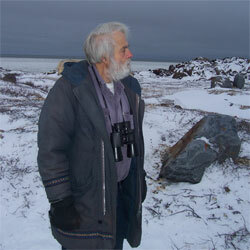 Few people, if any, have done as much for bears as Dr. Jonkel. And yet, there was still another side to Charles Jonkel – the passionate gardener, devoted grandfather, the quirky character who gives out handmade leis at the Missoula farmer’s market, a survivor of the Great Depression who can find a use or a recipe for literally anything. Jonkel treated everybody with the same respect and generosity, whether he is talking to an esteemed biologist or a homeless man down on his luck. Jonkel’s spirit touched everyone he met. To celebrate the life and work of Dr. Jonkel, Dr. Frank Tyro, Matt Anderson, and Shannon Donahue teamed up to create a documentary about the man and his life. The film examines “the vanishing world of Chuck Jonkel,” focusing on the vanishing Arctic as well as the quirky world of one of the most interesting characters of our time. The documentary team preserved film reels of Jonkel’s work in the Arctic, collected Jonkel’s stories, and interviewed colleagues, friends, and family. The film premieres April 20th, 2017 at the 40th International Wildlife Film Festival in Missoula. Frank Tyro has been involved with the Great Bear Foundation for over 30 years. His background includes 40 plus years in broadcast media and he brought local public television to the Flathead Reservation in 1988. He taught photography, tv production, and mass communication at Salish Kootenai College until his retirement in 2016, and founded and directed KSKC Public-TV. Frank has a B.S. in TV Production from MSU, Bozeman, an M.A. from Temple University, Philadelphia in Mass Communications and PhD from the Union Institute and University, Cincinnati in e-learning. He received the Distinguished Service Award from SKC, was president of the Montana Public Television Association, and president, Big Brothers and Big Sisters of Lake County. He has presented on American Indian Learning Styles, Constructivist Theory and Successful Online Courses at conferences in the U.S., Norway and Canada. He is President of the Great Bear Foundation Board of Directors. Frank lives in Pablo, MT with his wife, Dr. Lori Lambert and their sled dogs. Shannon Donahue, executive director of the Great Bear Foundation, holds an M.Sc. 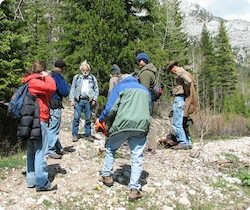 in Environmental Studies from the University of Montana with a focus in bear conservation and education. She holds a B.A. in Creative Writing from the University of Montana and studied History and Literature at the National University of Ireland, Galway. 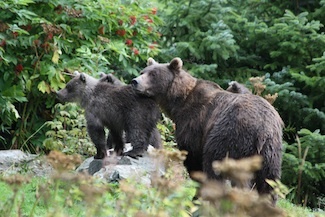 In 2013, Shannon set up the Northern Office of the Great Bear Foundation in Haines, Alaska. Shannon first encountered Dr. Jonkel when he gave a talk at the University of Montana on the Spirit Bear, and has been inspired by him ever since. Shannon lives with her two dogs in an old growth forest in Haines, Alaska. Documentaries are expensive to make and require a tremendous time commitment for planning, filming, and editing. The documentary team is appealing to friends and supporters of the Great Bear Foundation and Charles Jonkel for financial support for this worthy project, and has set a goal to raise $25,000 for the documentary. Jonkel has influenced and inspired so many people through his scientific studies, advocacy, educational projects, and through his compassionate and generous character. Please help us pay tribute to this man whom all of us admire, and who contributed so much to bear conservation and biology around the world. Checks can be made out to The Great Bear Foundation. When contributing, please specify that your donation is intended for the film project. The Great Bear Foundation is a 501 (c)(3), and all donations are tax-deductible in the U.S. Donors will be listed in the film credits. The Great Bear Foundation has a long history of promoting ethical, accurate, and sensitive wildlife media, and working to eliminate the inaccurate, sensational portrayal of wildlife and the harmful practices that accompany them. In decades past, many of the biggest threats to wildlife came from consumptive use of the animals and their habitats—overhunting and lack of protective measures for habitat conservation took dramatic tolls on wildlife populations. Human-caused wildlife deaths and habitat loss continue to harm wildlife populations, but over the past few decades, shifts in attitudes toward wildlife are changing the way people behave and interact with wildlife. Contemporary attitudes toward wildlife often center around getting close to wild animals, and establishing relationships with them that are both inappropriate and harmful to the animal. This new attitude toward wildlife is born of several decades of harmful wildlife media. Wildlife photography, film, and ecotourism are often considered “non-consumptive use” of wildlife, but that is a misguided term. These uses may not actively or intentionally revolve around killing wild animals, as more traditionally “consumptive uses” like hunting do, but they still constitute a “use” of wildlife, and that use is rarely as benign as they appear. While there are filmmakers and photographers who care enough and have the patience to create high quality products that depict wildlife with accuracy, sensitivity, and little impact to the animals and their habitat, those professionals are in the minority. Good wildlife media is expensive, time-consuming, and extremely difficult to make, and too often the products are overshadowed by the more popular in-your-face style wildlife media that depicts animals in sensational, inaccurate, or inappropriate ways. Harmful wildlife media can impact the specific animals featured by stressing the animals out, and causing them to have to make up for an energy deficit spent dealing with the stress of being filmed, and sometimes compromising the animal’s survival. Further impacts may include habituating the animals to human presence, causing the animals to lose their fear of humans, and putting them in vulnerable positions with humans in the future. Some filmmakers and photographers even bait animals with food and other rewards, stage interactions between animals that would not have occurred otherwise, provoke animals into unnatural and uncommon behaviors for the sake of drama, and use captive, trained animals without informing viewers. While these impacts on individual animals can be harmful and even deadly, the broader impacts on wildlife and on the public pose a more serious threat. Major trends in wildlife media over the past two decades have encouraged a “get-close-to-wildlife” mentality. Celebrities in the wildlife media industry gain fame and cult status by harassing animals on film, handling wild animals unnecessarily, provoking animals by getting too close and interacting with them, and cultivating an attitude among the public that the best way to enjoy wildlife is to interact with animals, rather than the more appropriate, less-invasive methods of observing the natural behavior of an animal in its habitat, as it would behave without provocation from humans. The Great Bear Foundation maintains a library of wildlife media at our office, and we review films, television programs, and photographs to determine which products offer an accurate, ethical view of wildlife, and which are more likely harming wildlife, habitats, and the ways the public perceives and interacts with them. In order to promote ethics and accuracy in wildlife media, GBF President, Charles Jonkel co-founded the International Wildlife Film Festival (wildlifefilms.org/), the first and longest-running wildlife film festival. While Jonkel stepped down from the Film Festival several years ago, he and GBF remain active in the struggle for ethical, accurate, sensitive wildlife media. There are many ways you can help. Be a discerning viewer, thinking critically about what you are watching, how wild animals and their habitats are depicted, how shots and scenes may have been achieved, potential impacts, and what kind of message the public is getting from the program. Speak up, and let the wildlife media industry know that you value high quality, informative programs with minimal impacts on the animals and their habitats. If you photograph wildlife, be mindful of your own impacts—do not approach or crowd animals, learn their behaviors and how they communicate and display signs of stress, allow the animal multiple exit routes, and do not feed, reward, or do anything to change the behavior of the animal or impact the habitat. Late GBF co-founder Charles Jonkel wrote the preface to this new book that explores the life and work of a filmmaker who has set the bar for ethics, accuracy and sensitivity in wildlife media. 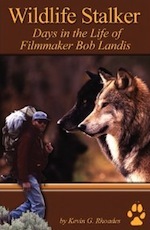 Jacket copy: Recording incredible wildlife behavior on movie film and high-definition video is the hallmark of Bob Landis’ films. For more than 40 years, he has made wildlife movies about swans, coyotes, elk, bison, bear, otters and more, and he loves to show the unusual: an eagle drowning a duck or a coyote chasing a wolf. This book is two narratives wound into one: a depiction of days afield with a wildlife cinematographer who has filmed and co-produced stories about Yellowstone’s iconic species – the bear, the wolf, the bison – and a collection of flashbacks to Landis’ past, growing up in small-town Wisconsin. The Gitga’at Nation of Harley Bay, B.C., has shown strength, courage, and resolve in their opposition to Enbridge Inc.’s proposed Northern Gateway Pipeline project. If built, the pipeline would carry bitumen, the heaviest, thickest form of crude oil, from Alberta’s tar sands to the remote coastal village of Kitmat, B.C., to be shipped out via tankers through the rugged, ecologically sensitive Inside Passage to refineries in Asia. A second pipeline would carry natural gas from tankers in Kitimat back to a terminal in Bruderheim, AB, to be used to dilute the viscosity of the crude bitumen extracted from the tar sands, so it may pass through the westbound pipeline more easily. The pipelines themselves threaten the terrestrial ecosystems they would pass through in Alberta and B.C. Enbridge’s recent track record includes hundreds of regulatory violations during pipeline construction, and several major pipeline ruptures in the United States alone, most notably the 2010 breach that spilled 877,000 US gallons of heavy tar sand bitumen into Michigan’s Talmadge Creek, and ultimately, the Kalamazoo River. Threats to coastal and marine ecosystems are even more alarming. Coastal B.C. is comprised of biologically diverse, abundant, wild habitat that supports robust populations of brown and black bears (including the rare white Kermode subspecies that lives nowhere else on earth), wolverine, wolves, humpback and gray whales, orcas, and some of the world’s last strong runs of Pacific salmon, among myriad other species. The ecosystem services of this region are invaluable, and the temperate coastal rainforest is highly sensitive to the ecological disturbances that would result from an oil spill. The region is so valued both for its unique ecology and the commercial value of fisheries and other natural resources that an informal ban on oil tankers has been in place since 1972 in Queen Charlotte Sound, Dixon Entrance, and Hecate Strait. Rocky coastline and volatile weather pose extreme risks to marine traffic, and the remote location would make an oil spill difficult to contain even in the best conditions. The proposed route for oil tankers includes four dangerous right-angle turns, and a spill the scale of the 1989 Exxon Valdez spill in Alaska would cover an area from Washington State to the southern Alaska panhandle. Super tankers could carry up to two million barrels of oil. The type of crude oil in question, bitumen, is the most difficult to clean up, because of its heavy, viscous nature. More than 60 First Nations stand together in opposition to the pipeline and tanker project, and the Gitga’at Nation has led the way with strong, well-organized, and highly publicized opposition to the project since 2006. The Gitga’at community of Hartley Bay lies at the entrance of Douglas Channel and would likely suffer the greatest economic and cultural losses in the case of a tanker spill. The community subsists primarily on the area’s natural resources for food and livelihood, with 40% of food coming from the ocean. The community could not survive if those resources were lost. The Gitga’at Nation has secured intervener status in regulatory hearings, along with several other First Nations. The Gitga’at have funded studies and improved communication infrastructure in order to hold National Energy Board hearings on the proposed project locally in Hartley Bay. At the time of writing, the community of 160 people has opened its homes to house and feed over 300 people while the hearings take place, March 1-3. The Great Bear Foundation strongly opposes the Northern Gateway pipeline and tanker project for the threats it poses to rare and valuable ecosystems, spirit bear and brown bear habitat, and the First Nations and other communities. GBF also opposes the project for its support of Alberta tar sands development and the myriad environmental and cultural impacts, including its significant contribution to climate change that threatens the polar bear and other important species. In solidarity with the Gitga’at Nation’s opposition to Enbridge’s Northern Gateway pipeline and tanker project, the Great Bear Foundation has made a monetary contribution to the Hartley Bay Band, and we are committed to raising awareness about the project’s threats as well as the Gitga’at Nation’s fierce, well-organized opposition to it. GBF is raising funds to help defray the costs of regulatory hearings, studies, and all activities that oppose this project. You can donate securely online below using the PayPal link below. Or, you can donate by mail; checks can be mailed to the Great Bear Foundation, PO Box 9383, Missoula, MT 59807. Please specify that your donation is meant for support of the Gitga’at Nation and their fight against Enbridge’s Northern Gateway Pipeline. Interested in supporting this project? Click here to donate! The Chilkoot River in Haines, Alaska is a popular salmon stream that supports brown bears (Ursus arctos), five species of Pacific salmon, and an array of human activities, including sport-fishing, bear-viewing, and camping. The river presents a unique opportunity to study the factors affecting how bears use their habitat, and their fishing success, in relation to salmon abundance and human activity. The Chilkoot River is home to a run of sockeye salmon (Oncorhynchus nerka) that migrate upstream in early summer, pink salmon (O. gorbuscha) that migrate in late summer, and coho salmon (O. kisutch) that migrate in early autumn. Chilkoot brown bears primarily fish for pink salmon, because they are smaller, abundant, and easy to catch with minimal energy expense. Bears frequently fish in proximity to humans, and draw attention from bear-viewers and photographers. Young bears and females with dependent cubs often fish the lower Chilkoot River, close to people, because the human presence tends to discourage visitation by older, more dominant male bears, that can pose a threat to cubs and less dominant bears. The Chilkoot River Monitoring Project builds on previous research by Anthony Crupi, monitoring bear activity in relation to human presence. We aim to build a long-term database to inform management, and to offer a better understanding of dynamics among salmon, humans, and bears on multiple-use salmon streams. The project uses remote-sensor wildlife cameras to monitor four areas along the Chilkoot River Corridor, collecting data on brown bears’ foraging success and habitat use, and how these factors may be influenced by various human uses. At the same time, trained citizen scientists make in situ observations over the course of randomly selected three-hour time blocks each day, recording foraging bouts, and human activity. Data collected during in situ observational periods includes bout length, bout location, number of salmon caught, and bear identity. These data will be used to validate the ability of the video recorders to accurately capture foraging bouts, and data collected from video recordings will supplement the in-situ observations. Vehicle traffic on a road running alongside the lower Chilkoot River provides an additional variable. We will monitor vehicle traffic using a tubeless, infrared traffic counter from TRAFx Research, Ltd, who generously supports this project. See the traffic counter we’ll be using here: www.trafx.net. This project is supported by a generous grant from the Alaska Chilkoot Bear Foundation, the Charlotte Martin Foundation, TRAFx Research, Ltd., and donations from members of the Great Bear Foundation. Special thanks to Ian Gill for his work on this project.